234 p., 14,7 x 20,8 cm. With contributions by Georg Bruns, Peter Dettmering, Ludger M. Hermanns, Willi Hoffer, Laurence Kahn, Martin Teising, Wolfgang Walz and Reiner Winkler. The aim of this reprint of a 1962 work by Willi Hoffer of London on the social and scientific obligations of the psychoanalyst is to show the significant role he played in the restoration of psychoanalysis in Germany after 1945. 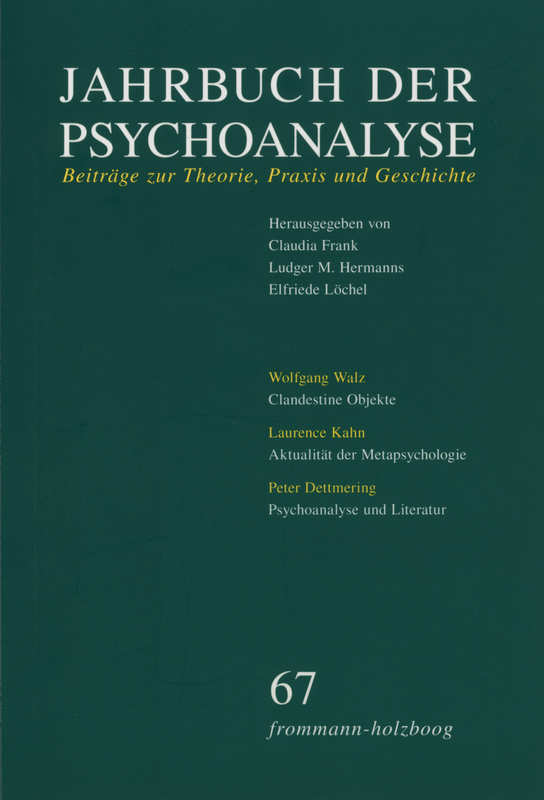 At the same time, it is our objective to compare his theories from the beginning of the 1960s with the current status of psychoanalysis based on two contemporary commentaries by two former chairmen of the German Psychoanalytic Association, Georg Bruns und Martin Teising. Clinical contributions by Reiner Winkler and Wolfgang Walz enhance this volume which concludes with the 20th Karl Abraham lecture in Berlin held by the Parisian psychoanalyst Laurence Kahn, an article on the theory and the technique of psychoanalysis as well as the 13th Wolfgang Loch lecture by Peter Dettmering on psychoanalysis and literature. The paper deals with the British analyst Willi Hoffer and his relationship to German psychoanalysts in the post world war II period. There are two different aspects to be recognised: Those contacts resulting from his institutional responsibilities as vice-president of IPA, editor of the Int. J. PSA and president of the British Psychoanalytical Society towards the representatives of the DPV (German Psychoanalytical Association) on the one hand; and the more personal friendship with Alexander Mitscherlich from Frankfurt am Main whom he supported in building his Sigmund-Freud-Institute. Hoffer tried to mediate between the two centers in Frankfurt and Berlin but stood in strong support for the DPV against DPG (German Psychoanalytical Society). He had initiated the meetings of the germanspeaking psychoanalytical societies of central Europe since 1959 and was one of the visionaries of the EPF (European Psychoanalytical Federation). Finally some of his character traits that led to his eminent role as supporter for psychoanalysis in West Germany after Hitler are highlighted. This article poses four questions to the keynote address which Willi Hoffer gave in Berlin in 1960: How does he deal with the recent German past? What understanding of clinical psychoanalysis does he communicate? What did Hoffer say about the social challenges that organized psychoanalysis had to face at that time? How relevant are they today? To begin with, the Berlin speech is compared to the one which Hoffer had given two years previously in Vienna on the 50th anniversary of the Psychoanalytic Association. Hoffer describes a conflict between social demands upon psychoanalysts and their scientific obligations. Therefrom he deduces, though regretfully, that the social expectations ought to be rejected. However, since the integration of psychoanalytical treatment procedures into the German public health system, psychoanalysis has not been able to maintain a socially predominantly abstinent conduct and to get involved with society only in a cautious and limited way. As some of its members feel, psychoanalysis has been injured during the process of being integrated into the medical system as a treatment method. However, by this step psychoanalysts in Germany could avoid that patients were selected according to economic aspects. Due to the lack of methodical development in research for a long period, psychoanalysis as a science has come into a position of minor importance, which finally came to threaten even its originally strong therapeutic importance. The demand for proof of effectiveness according to principles of general psychotherapeutic research led to the combination of psychoanalytical with various other research approaches. In this context psychoanalytic therapy showed to be effective in an unexpected way. The expanded scientific practice lead psychoanalysis to reflecting and extending its epistemological state based on a double discourse: It found a way to resolutely advocate subjectivity in treatment and to transcend the single case by use of a transparent and replicable research methodology. This development makes it grow closer to the standard principles of science without forcing it to give up its special features. The author describes with detailed clinical material from the psychotherapy of an adolescent young man two different forms of acting out in the transference and countertransference. Both enactments, to different extents, undermined the psychoanalytic setting and relationship and threatened to throw it off course. Nonetheless, as it had been possible to think about and to some extent work through these enactments in the transference/countertransference, the patient’s ›liberation movements‹, enacted according to his compulsion to repeat, and the respective counteractions of his therapist also opened up the possibility of a changed perception and experience of self and object in both ›actors‹. Using Herbert Rosenfeld’s differentiation between partial and total acting out, different qualities of enactments are being described and examined. Furthermore, a developmentally informed view of adolescent acting out, derived from the analysis of children, comes ›into play‹. This article is about the difficulties an analyst might encounter, when attempting to point out or interpret a patient’s nonverbal expressions containing material pertaining to primary processes. An observational clinical fact depicts the vantage point of exemplification: Some patients refuse to include their customary need for certain objects, which they bring along or mention, into the analytic reflection process. It is an obvious, yet secretive, need for objects with an inherent hallucinatory explosive force. A narrative by Pirandello serves as a model of inter-subjective genesis of a hallucination, unleashed by the unveiling of a secretly needed object, which is subsequently transformed into an uncanny object. The term clandestine object has been established in order to illustrate further notions casuistically. These pertain to the cause of the underlying transformation disorder embedded in the experience of the historical subject and its primary objects, as well as the pathological nature of the transformations the patient performs during analysis, and the resulting difficulties for the analyst’s interpretation. Problems of subjective appropriation are considered to be constitutive for each of these three aspects of transformation disorders. Furthermore the requirements of a subsequent appropriation of the patient’s transformation capacity during analysis and the consequential difficulties are discussed in the light of Winnicott’s following statement: »Many of our patients come with this problem already solved – they can use objects they can use us and can use analysis, just as they have used their parents and their siblings and their homes. However, there are many patients who need us to be able to give them a capacity to use us. This for them is the analytic task. (Winnicott 1971 , 126)« The term »Objektgebrauch«, deriving from Winnicott’s notion, is defined as the subject’s primary need to use the transformative function of the primary object (or the analysts). The term »Objektverwendung« is distinguished by the subject’s capacity to use transformation as a secondary process on their own, which is appropriated by using a transformative primary object. Along the same lines the use of pre-existing theory by the analyst is differentiated from the transforming use of other analysts’ theories, which are considered to be the prerequisite of the subjective appropriation of personal theoretical notions. The specialty of the analytic hearing is totally defined by the discovery of the unconscious in Freud’s work. This makes it necessary to think about the essential changes in the contemporary analytic practice. Which consequences ensue from the dispensation of the drive concept? How should one conceptualise the transference mechanisms, especially when they are being enacted? Can the psychoanalyst renounce the complexity of the metapsychology, when he is trying to probe into the causes of repetition and its repercussions? In response to these questions, the author refers to her psychoanalytical experience as well as to theoretical reflections. The lecture looks back to the first relationship between psychoanalysis and literature in Sigmund Freud’s »Mittwoch-Gesellschaft«nd the further development of this relationship, of which it is obvious that the interest in the psychology of genius has gradually changed into a growing interest in the question of creativity. A second part describes four models of interpretation – introduced by Freud himself – and shows, in what degree the literary authors modified Freud’s discoveries for their own devices. There are certainly certain elements common to both.